Angeline C. Stanisch, 90, of Port Washington, formerly of Cedarburg died Thursday, July 21, 2011 at Heritage Nursing and Rehabilitation Center in Port Washington where she had been a resident the past few years. 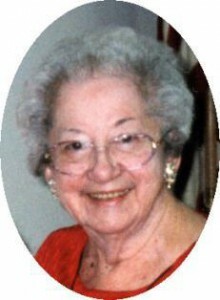 She was born on November 23, 1920, daughter of Jacob and Elizabeth Lorge Weber in Port Washington. Over the years she had worked at the former Allen Edmonds Shoe Company in Lake Church and did assembly work at Bolens Mfg. Co., Port Washington during WW2. She was a clerk/sales/alterations for the former Smart Shop ladies boutique and Klein’s Clothing Store once on Franklin Street in Port Washington. She will always be remembered as a “smart dresser”. She loved her family and enjoyed socializing with her lady friends. On July 14, 1945 she married Alfred Stanisch of Sheboygan at St. Mary’s Catholic Church in Port Washington. For many years they lived on East Douglas Street in Port Washington. He preceded her in death on May 31, 1967. In 1989, she moved to Cedarburg, but returned to Port Washington on 2005. She is survived by her daughter Cheryl (Fred) Ullerich of Plymouth, seven grandchildren, six great-grandchildren, a sister Alice Meyer of Wauwatosa, a brother Leroy (Ann) Weber of Chilton, daughter-in-law Michelle Stanisch of West Bend, nieces, nephews, other relatives and friends. She is preceded in death by her husband Alfred, her son Robert “Bob” Stanisch, her sister Sylvia Jacque and brother-in-law Vic Meyer. Her funeral mass will be celebrated at Noon, July 26, 2011 at St. Peter of Alcantara Catholic Church, 1802 N. Wisconsin St., Port Washington. Reverend Patrick Wendt will be the celebrant. Interment at St. Mary’s Cemetery in Port Washington. Visitation 10AM-Noon Tuesday AT CHURCH. Memorials are appreciated.